Our seventh day in Italy was finished with a train travel from Venice to Milan. The ticket cost 35 euro per person. We stayed at the Hotel Cristallo located right near the railway station. 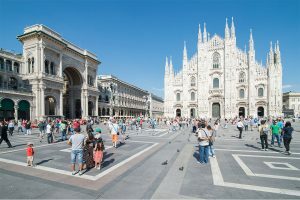 Because of lack of time we devoted the day to visiting the Galleria Vittorio Emanuele and a short walk around the Duomo. Our eighths day was fully devoted to the tourist attractions of Milan. We started the day with climbing up onto the Duomo and visiting the Sforzesco Castle. Then after a walk around the city park we made our way to the San Siro stadium. We came back to the Galleria Vittorio Emanuele and then went to the local “Venice” – Viale Gorizia.